For fifty mornings each year, the Empire State Building opens up early for 100 people to witness one of Earth's finest sunrises and a city awakening. Be transported while immersed in the rich history as you journey through this Art Deco masterpiece including the landmarked Fifth Avenue lobby and murals. Then ascend to the 86th Floor with your guide and stay as long as your schedule allows you. Stay all day if you wish and enjoy one or more of the eight in-building dining options including the contemporary cuisine of STATE Grill and Bar and Tacombi, an authentic taqueria. Departure Location: The Empire State Building Observatory entrance is located at 20 West 34th Street (between 5th and 6th Avenue). Departs: The Empire State Building Sunrise Experience is available for limited departures on Fridays and Saturdays through the year. See our calendar for dates. Start Times: Varies throughout the year depending on season...it's always stunning though! Earliest start time is 5am, latest is 6.45am. The perfect cure for jet-lag - what else are you going to do? Your Empire State Building Sunrise Experience ticket allows you to access the Empire State at sunrise on your chosen day only. You will need to join the line for the elevator and mandatory security check. The Empire State Building Observatory Ticket does not include access to the 102nd Floor Observatory (these tickets can only be purchased at the Empire State Building itself. Current price $20 per person). All sales are final. This ticket cannot be cancelled, refunded, exchanged or used in conjunction with any other offer. 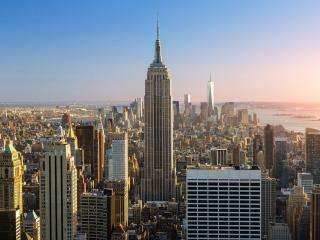 Do I need to book a date or time when I visit the Empire State Building? Yes, but only for this Sunrise Experience! Please see our other options if sunrise is too early for you. Your gate ready ticket voucher will be available to download as soon as your booking is paid. All you need to do is present your ticket on your mobile phone, or print at home before arriving at the attraction. Will I need to queue to get into the Empire State Building? There may be a brief queue when you arrive.